Conservation banks are specific areas of land used to preserve, enhance and protect threatened and endangered species and their habitats. Developers needing environmental solutions for their projects can use credits — units of trade utilized for the purpose of offsetting ecological losses — from these banks to compensate for anticipated adverse impacts to threatened, endangered or special-status species in similar ecosystems. For developers, conservation bank credits save time and money, and eliminate permitting uncertainties. “The alternative to using credits is to essentially do it yourself — acquire property, review the biology, develop a resource enhancement and long-term management plan, perform the necessary restoration actions, monitor the site for success — and fix it when it doesn’t succeed — and manage the site in perpetuity,” says Paul Sherman, a project manager for Burns & McDonnell. 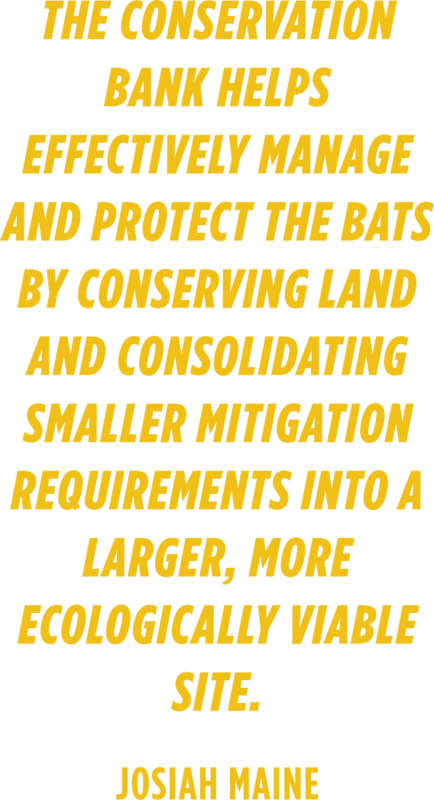 In areas occupied or visited by Indiana and northern long-eared bats, this do-it-yourself approach often had been the only option available to developers looking to build a road, install a power line or otherwise address infrastructure or other construction needs. But now there’s an alternative. 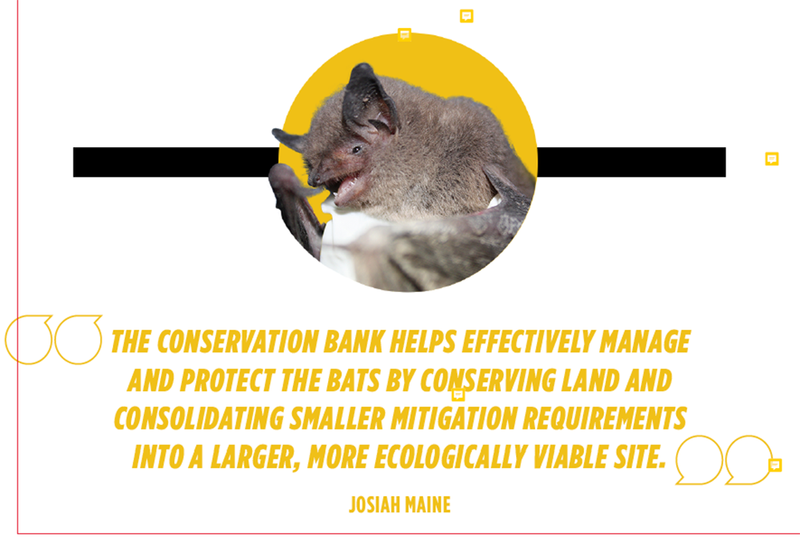 The Chariton Hills Conservation Bank in Missouri provides 1,300 acres of dedicated natural space for such bats, which are listed as threatened and endangered in the U.S. By conserving this space, the bank offers credits to developers, who then can use them to offset impacts their work might have on the two species. 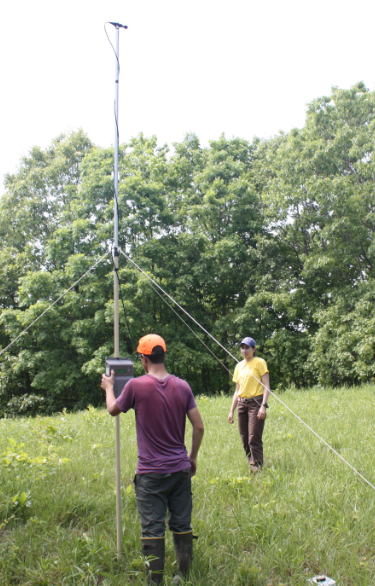 Setting up acoustic equipment at Chariton Hills Conservation Bank are environmental scientist Josiah Maine and wetlands specialist Marie Russo of Burns & McDonnell. The bats inhabit caves and forests in the East and Midwest. 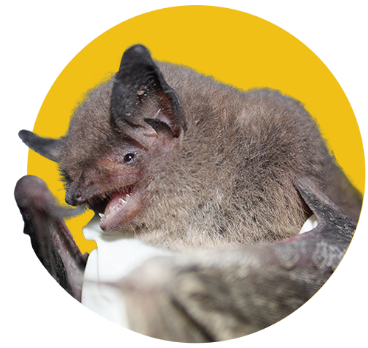 Upon emergence from hibernation in the spring, the Indiana and northern long-eared bats migrate to establish summer maternity colonies in suitable habitat throughout northern Missouri, southern Iowa and western Illinois. The newly established bank provides conserved summer foraging and roosting habitat. For Chariton Hills, Burns & McDonnell worked with the U.S. Fish & Wildlife Service to identify appropriate properties, evaluate their biological attributes, perform environmental enhancements and develop interim and long-term management plans. The team also recorded a conservation easement on the bank property and is funding a non-wasting endowment, which will be tied to the land and provide funding for long-term management activities. The conservation easement and endowment are held by the Missouri Conservation Heritage Foundation. Find more details about the Chariton Hills Conservation Bank or inquire about credit purchases here.